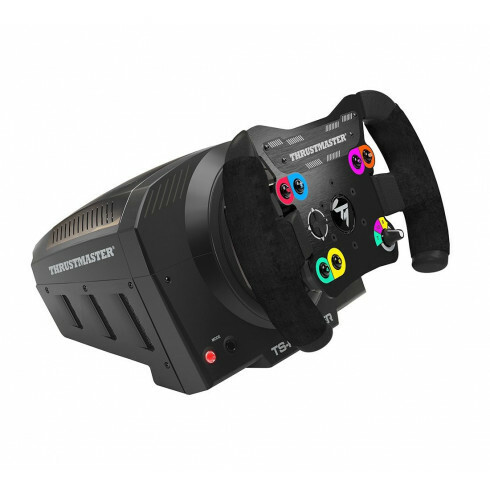 The Thrustmaster TS-PC Racer is a powerhouse of technologies for PC, created to enhance gaming performance and offer a racing experience closer to reality, allowing gamers to be fully immersed! The TS-PC Racer is Thrustmaster’s ultimate racing simulator for PC racers. It faithfully reproduces the car’s response and track conditions. Thanks to the Thrustmaster Ecosystem the TS-PC Racer wheel is fully compatible with numerous Thrustmaster add-on's, like the detachable wheels, the T3PA and T3PA-PRO pedals and the TH8A shifter. This way you can customize your perfect racing setup! To provide a high level of performance, precision and comfort to highly-demanding PC gamers, Thrustmaster developed the TS-PC Servo base. It features an industrial-class brushless 2nd gen motor offering 50% more dynamics and 4 times greater stall force. The torque is 1.6 times higher than TX and T300’s torque! Combine this supreme PC racing wheel with a Playseat® racing simulator and you will have the ulitmate fun and realistic experience at home! Maintains dynamics with the new motor by ensuring that there is no overheating, while remaining silent. Provides 50% more dynamics, 4 times greater stall force than TX and T300’s torque, and heat dissipation via monophasic cooling. Compatible on PC with detachable Thrustmaster wheels, with 3-pedal pedal set Thrustmaster T3PA and T3PA-PRO and with the TH8A shifter. I've been owning the TS-PC Racer for over a month and I think it was good to give some kind of feedback/review from the product. I simrace quite a lot and I m usually running iRacing as primary software and Assetto Corsa just for having street cars. My first thoughts and notices about TS PC Racer was the wheel is a lot smoother than for example T500 RS, since it has the brushless servo motor. You can feel the motor or should I say the belt resistance a little while the PC is off and you turn the wheel, but while driving when the Force feedback kicks in the wheel feels really smooth and I cannot feel those belt's steps like I felt them with my T500 RS. The feeling is quite the same than in T300 but the wheel is a lot more stronger, Imo much greater, and even on straight line you can feel all the bumps from road surface (in iRacing) what I cannot feel with T300. in T300 I only felt the forces during cornering. And in my opinion the TS PC Racer motor is so fast it made me correct the over/understeer more quickly. The price is a little high but for me it was on the limit but I still bought it and dont regret it at all. Best wheel I have ever own.